Above is a photo of a macro of flower I photographed in Hawaii, a photo of ArtMuse Dog on our friend's boat for the first time, and the last is a haiku with the prompt being 'chrysanthemum'. Hope this adds a little 'dazzle' to your week and that you will check out the wonderfully creative bloggers listed above. Pretty flower and darling life vest. I just can't get over how cute ArtMuse Dog is! What a doll. What a joy to read this haiku accompanied with those lovely pictures of a beautiful hawaian flower and your first boat trip. Thank you for the every day entries for Carpe Diem. This haiku is very well done and could easily have been written by one of the classic haiku masters. Adorable dog for sure, and love your card photo! 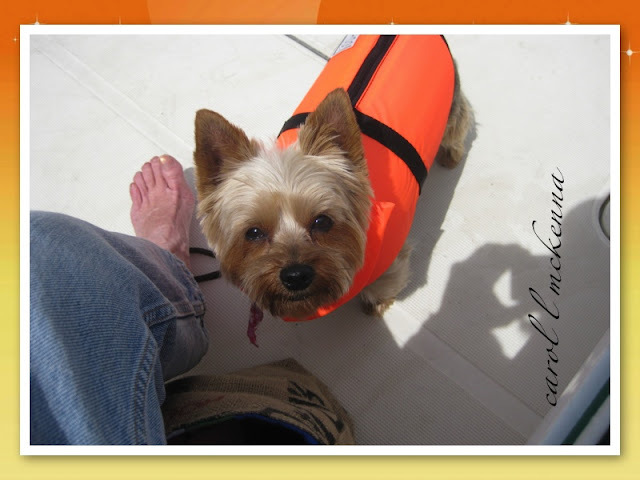 art muse dog looks wonderful in the life jacket!! Little pup looks like he's pretty comfortable with that life vest! Hawaii is so full of gorgeous flowers! Your dog is so cute, lots of personality, I bet! Zoe's been out on the high seas again? You go, girl! I agree with Kris - your haiga is masterful! Beautiful Flower Pic& lovely verse! I wish you the best on putting together your wonderful poetry into a book! Lovely flower and poem. Your little dog is so sweet in her life vest. as always much beauty to discover here Carol! 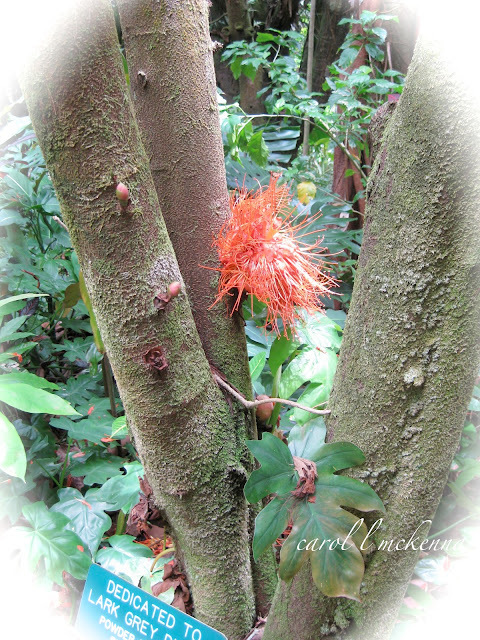 What a gorgeous flower--and on a tree?